​ This Advent season, the Holy Redeemer family invites you to experience four stories of faith and the encounters that have led them closer to Christ. As we draw near to Him, how will we allow this season of excitement and wonder to become one that authentically reflects Emmanuel, "God with us"? Rather than getting lost in the excitement the world suggests, consider the gifts you can give yourself by getting lost in the wonder of this journey of faith... that all began in Bethlehem. These stories that God has written in our parish is the sharing of their own Emmanuel. Our prayer for you is that this Advent, thru encountering these witnesses, you may encounter your own Emmanuel. Advent is a season of waiting. Emily Chamness’s testimony this week speaks to the hope of our faith, that Christ always awaits US each day in the sacrifice of Him in the Holy Eucharist. Thru faith, Christ has planted that hope in Emily...how can you abide with Him each day as you await the joy of His birth? Do you yearn for a renewed peace in your heart amidst the schedules and demands of the season? Of life? Jesus tells us that no matter how busy we are or how many challenges we are facing, He is the answer to our search for peace. Listen as Amy shares her inspirational story of how despite life’s circumstances, she has found peace and confidence in our Lord Jesus. Through his joyful spirit, Father Sudhakar shares this week about his family and upbringing. Father’s journey from India to southern Indiana and then to Holy Redeemer has required him to trust in Jesus with his whole life. In doing this, Father has found joy awaiting. May we all place our trust in Him as we await the birth of our Lord. Maranatha…Come Lord Jesus… Your joy awaits! When we think of the Christmas season, and the beauty that it holds, we often reflect on those memories of our most cherished gatherings. Christianity was born on Christmas Day. And as Catholics, we know that our most fruitful bonds of family and friends are rooted in the Faith that calls us home on Christmas. Bill & Clara's story exemplifies the wisdom of a life built on their "three-legged stool" and the beauty of relationships that have grown from their seeds of faith. with Little to No Prep Work! Pick up a straw piece for each member of your family before or after every Sunday Mass during Advent at Holy Redeemer. Take home your straw pieces and add your own personal prayer to the back of the straw. Place your straw pieces in your nativity scene at home. Pray together as a family for all the prayers in your nativity scene each week. 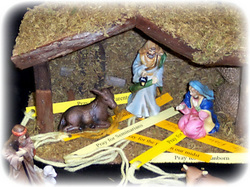 Return your straw pieces to Church each week and place them in the bed of baby Jesus in the nativity scene . Have an Advent wreath. Don’t over complicate this. 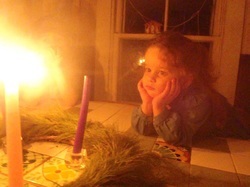 The simplest Advent wreath will do. If Advent has already started, that’s ok. Just go ahead and put your wreath together, then light the first candle one evening and let it burn down a little. Catching up isn’t hard to do. 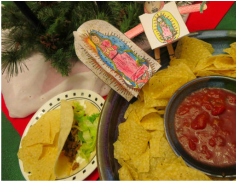 Celebrate the feast of Our Lady of Guadalupe (December 12th) by eating Mexican food for dinner. There are lots of ways to celebrate these days, but you have to cook dinner anyway, right? May as well be tacos. If you have a statue of our Lady of Guadalupe, set her on the table as a centerpiece. Put out a Nativity set. Put it front and center in your home. Up on the mantel is a great choice. This is an easy way to send a message of what’s the most important for this season. Have a "Baby Jesus Hunt", then place him in your nativity set on Christmas Day! This is one of my favorite traditions, and so easy! Stuff shoes for St. Nicholas day (December 6th). This does not have to be difficult or complicated. 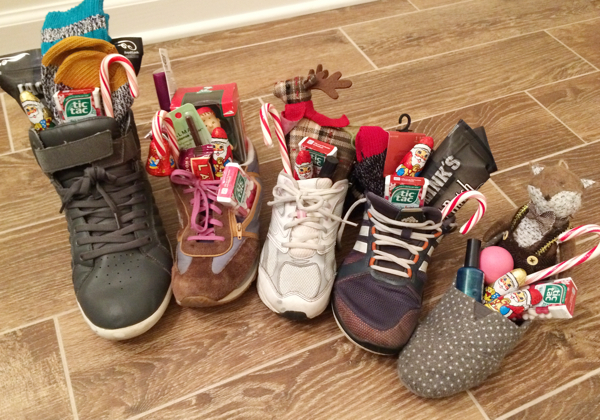 Have the kids put their shoes out, tell them the story of St. Nicholas, fill the shoes with goodies. Even just a few cookies in a ziplock baggie will do. Sing , or just listen too, Christmas songs. Stick with the ones you know the words to, and choose the religious ones- Away in a Manger, Silent Night, O Come O Come Emmanuel, O Come All Ye Faithful, etc. If you only know the first verse, just sing it several times in a row. Whether you’re in the car, or snuggled up in the living room, just go for it- the kids will love it even if you are tone deaf! Attend reconciliation as a family. A lot of churches have a large penance service during Advent- utilize it. This is a great way to prepare for the coming of our Savior. Go to Mass on the feast of the Immaculate Conception, December 8th. Actually, this is not optional since it’s a holy day of obligation, but it doesn’t involve any prep and it always falls during Advent. Make sure your children understand what this Feast day means- you can use this coloring sheet to help. St. Lucia (Lucy)’s feast day, December 13th- drive around and look at Christmas lights. This tradition started because her name means “light”. What a fun and easy way to celebrate this great feast day! If you aren’t feeling up to making saffron buns, you can make easy St. Lucy buns from canned cinnamon rolls and bring them with you. Pray the St. Andrew Christmas Novena with your family. This is a beautiful tradition. You can add it to your daily prayers, or do this in place of your current family prayers during the Advent season.